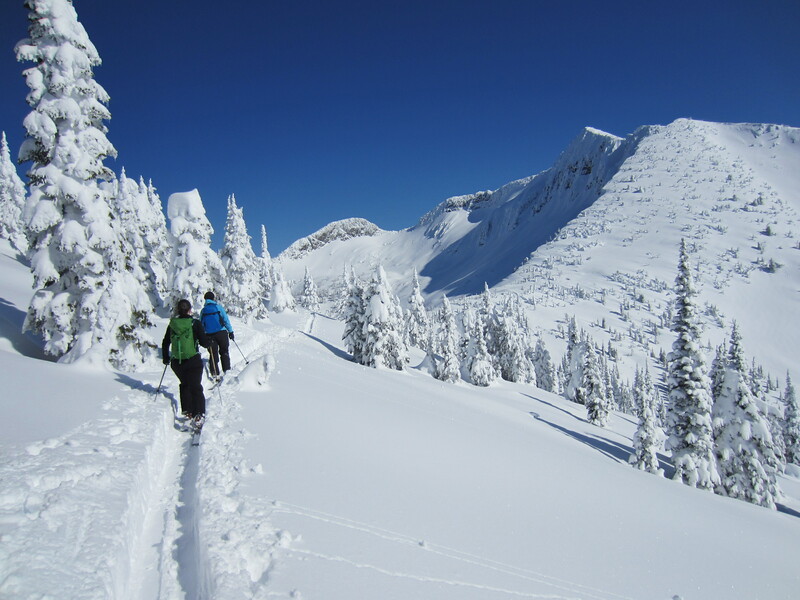 Karina and I spent a week skiing in Nelson that included the Kootenay Coldsmoke Powder Festival. It was a well-deserved vacation for Karina, whereas for me it was more a case of ‘getting away from already being pretty much away from it all’ (incidentally the title of a David Foster Wallace essay that I read during our trip while curled up next to the fire). Two of Karina’s longtime friends, Rob and Michelle, live in Nelson and own ROAM, an outdoor store that was the title sponsor for the ski-mountaineering race held during the festival. Their involvement with the race went far beyond simply kicking in some prizes; they oversaw the whole event, from timing, to organizing the volunteers, to re-breaking the skin track at 6:00am the morning of the race. And they were too polite to object to us imposing on their hospitality during such a hectic time. 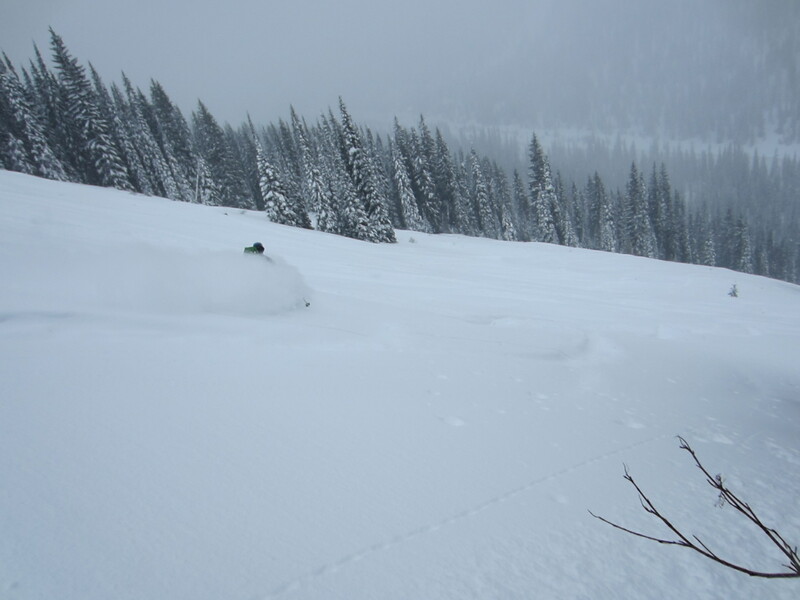 62cms of snow fell over the weekend of the festival. Karina skiing on the White Queen. Rob and Michelle were also great tour guides to the backcountry terrain around the Whitewater resort. 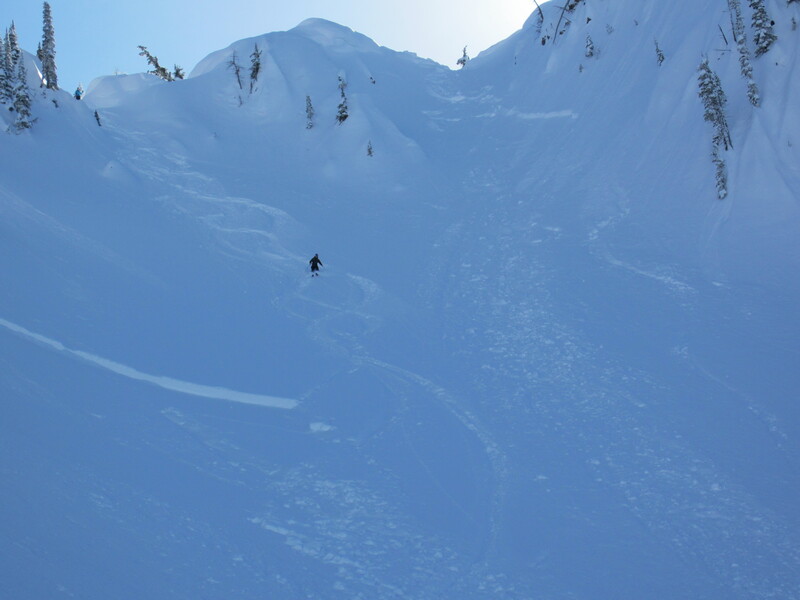 Although the avalanche conditions were a bit too touchy to ski any of the really impressive lines that are pretty much within spitting distance of the lifts, we still skied lots of great powder. Our most exhilarating run of the week, however, wasn’t on skis. We went for dinner at the wonderful home of Rob and Michelle’s friends Randy and Nella. They live high up an unplowed road, so Randy rode down on a quad and ferried us up (an adventure in and of itself). After dinner (and a few glasses of wine) we each chose a GT snow racer and took off careening down the three kilometers of icy and rutted switchbacks by headlamp. In spite of crashing repeatedly, I had so much fun that I’m considering giving up skiing in order to more fully pursue the exciting sport of tobogganning. Decidedly less fun, however, was hiking back up the hill the next morning to look for (and miraculously find) Karina’s car keys. Karina and Michelle touring in the Whitewater slackcountry with Ymir Peak behind. The Coldsmoke Powder Festival lived up to its name – it started snowing on Friday and didn’t really stop until the events had concluded on Sunday. With so much snow, the festival could’ve hardly failed to be a success; I certainly came away with a favorable impression of skiing at Whitewater. 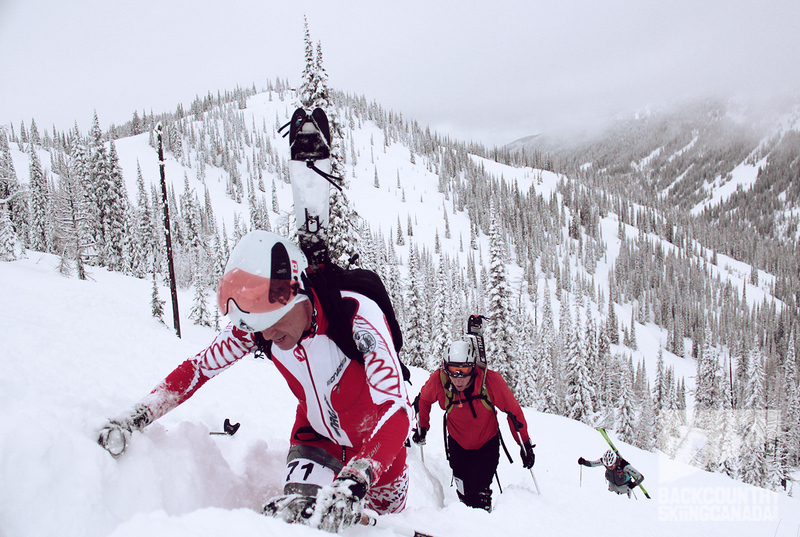 With the abundance of new snow and much of the course being outside the ski area boundary, the randonee race felt like a genuine Kootenay backcountry adventure. Although Rob was out putting the skin track back in at some ungodly hour the morning of the race, it’s fair to say that the new snow created a lot more work for the racer(s) at the front of the field. Thankfully, I think that people generally finished in the order that they deserved, with the field simply being more tightly bunched than it would have been otherwise. Karina skiing a run called Prospector's, just outside the Whitewater Ski Area. Overall, I was pleased with the way that I raced. I felt slightly fitter than I had two weeks prior and I was able to avoid repeating some, though not all, of my previous mistakes. The main technical aspect that I struggled with throughout the race was getting my skins to grip in the soft snow on the steeper climbs. There are few things more demoralizing than slipping and sliding backwards. I would flail and try to muscle through with my arms only to plunge my poles up to their grips in the deep snow next to the track. I was reminded of classic technique cross country ski races in my youth where I’d missed the right wax. The real challenge is trying not to dwell on it too much since there’s no guarantee that anyone else’s skis are any better and at least you’ve probably got good glide. I think that the ideal would be to have a quiver of skins so that for races with soft snow or extra steep climbs you could carry a backup pair with extra width and grip. A great photo giving a sense of how deep the snow was during the bootpack. Photo taken from here. My other demoralizing moment came when I skied off course on the penultimate descent. I’d studied the map, so I was able to correct my mistake before it was too late, unlike another unfortunate racer who got completely lost. However, the minute or two that I lost shuffling cross-country to get back on track was enough that I lost contact with the group in front and I was never quite able to close the gap. I ended up finishing in fifth place in about 2:53.